It’s show time: All over the world national standardization bodies vote these days if they approve Microsoft Office OpenXML file format to become an ISO standard or not. A lot has been written on this issue these days: noooxml.org, Linux Foundation, Groklaw, Reuters, netzpolitik.org, news.com etc. In Switzerland, it’s SIUG’s president Norbert Bollow as well as Theo Schmidt from Wilhelm Tux and Shane Couglan from FSFE who are the most active opponents of this standard. Particularly highlighting the chaotic process in Switzerland the WOZ will publish tomorrow a great article on the current situation. While I haven’t given up hoping that Switzerland at least votes ABSTAIN it’s quite likely that Microsoft will win this battle on our home grounds. By bringing in about 20 Gold Partners in the last 10 days this whole process has absolutely lost its technical value and has become a completely political push for Microsoft and a money making event for SVN. Well, I’ve done my job and just submitted for the second time (the first voting was annulled due to incorrect procedure by the convenor, Mr. H.R. Thomann) the /ch/open’s vote “DISAPPROVAL on Swiss vote on DIS 29500″. Update 2007-09-03: While the report on inside-it.ch writes about the irregularities of the voting procedure, the final result by SNV is now official: “APPROVED with comments” with 75.4% support - 0.5% less and Switzerland would have voted “ABSTAIN”, damn close! This week, the Alternative has released the new official ETH www.tux.ethz.ch website informing about Free and Open Source Software and providing various sources of knowledge on how to install Ubuntu, configure Linux laptops for the ETH network etc. When opening today’s Comments Resolution Meeting, the convenor H.R. Thomann pointed out the duration of the meeting was announced lasting from 10.15h till 12h – but added he didn’t specify if it’s 12 AM or PM. Well, he guessed right. When I had to leave the ongoing discussion at 15.15h we had only reached comment #8 of 19 to be reviewed by our committee. No wonder, both, the FOSS community and Microsoft, had successfully recruited various firms, educational institutions and associations to represent their interest in the discussion. For me, representing /ch/open and strongly opposing the ISO ratification of OOXML, this exhausting but still sometimes funny meeting explained many mechanisms of such standardization processes. First of all, as stated by Mr. Thomann in the beginning, standardization bodies such as SNV or ISO are measured by their performance releasing new standards so the main subject of the session was set: to agree upon the OOXML application as fast as possible. Second, though “general comments may request changes outside the scope of the standard,” basically only technical arguments were relevant in the discussion. Norbert Bollow of SIUG had carefully formulated comments considering a holistic view of the situation including the competitive position of Microsoft, IPR concerns such as patent threats as well as economic aspects of the role of standards for society. Nevertheless most of today’s discussion was on minor technical deficiencies (such as allowing the inexistent date of February 29th, 1900 in Microsoft spreadsheets) and on formal procedures. It was no surprise that the discussion was not very constructive even these issues as most of the 22 committee members opposed the standard completely. Third, as the attending ECMA secretary general Istvan Sebestyen explained to me, technical standards are never ideal solutions of a problem but only compromises by different industry players. Thus such standardization bodies can’t represent the interest of the technology users but need to find majority-winning and thus suboptimal resolutions. 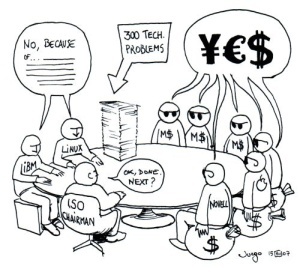 In my opinion today’s discussion missed the point – or I just expected too much of a ISO standardization process. As it was never the intention of the Comments Resolution Meeting, no one changed his or her mind concerning approval of OOXML. Also my major concern couldn’t be resolved: Why – if not to strengthen Microsoft’s quasi-monopoly on office software and relieving dull governments and uninnovative enterprises – should a second ISO standard be ratified for the exact same purpose of office file exchange covered by ODF (ISO/IEC 26300)? Because of unaccepted parts of the binary Microsoft Office format by the OASIS committee as the Trivadis representative reasoned? Then these format features could have been added by Microsoft engineers as extensions of ODF or a second version of the ODF standard might have included them if they were really that important (according to Rob Weir of IBM it’s the opposite around). Or do we need two file formats since free choice is important as Marc Holitscher of Microsoft likes to point out? Then please let me know who of you likes to carry around such huge magic power plug adapters which you need when traveling around in Europe? The idea for technology standards is to make life easier for its users and exactly not to compete on this level. And that’s why I don’t believe the argument of competition by the IWI representative of the HSW Lucerne and by Marc-André Hahn of sieber&partners (although admitting that 6000p office file formats might be a little more complex than a power plug and therefore improvements are possible). No question, competition is important for progress of technology, but not on the file format level (as long it’s for the same type of data) but on their implementation in software.